WILDFIRE™ ULTRAVIOLET SENSITIVE PAINT is the leading edge in UV visual effect paint for all the entertainment industries, including television and motion picture studios, theme parks, and nightclubs. 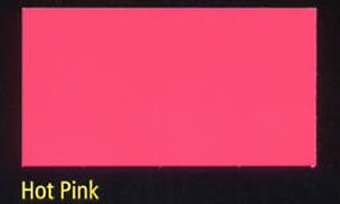 All Wildfire Fluorescent Water-based Acrylic paints are color balanced for use under UV blacklight. When the colors are intermixed, they create an unlimited color palette, including earth tones. All colors dry to a smooth matte finish. Best results are achieved when applied over a smooth, primed white surface. Fluorescent colors are recommended for interior use only. Use our exclusive, UV Inhibitor Varnish to help protect the fluorescent paint from destructive UV-B and UV-C, while still allowing the paint to glow under UV-A blacklight. Wildfire paints are 100% water-based and non-toxic. This permits easy application and clean up. They can be brush, roll, or spray applied—just like conventional acrylics. Supersaturated pigmentation creates the most powerful luminescence available. Wildfire paints look their best when applied to a smooth, properly primed surface. Repair any nail holes or other defects first and then properly prime the surface. We highly recommend using Zinsser’s Bullseye 1-2-3® primer-sealer to properly prime the surface. Wildfire paints are water-based artist-quality 100% acrylics. They are easily applied, just like conventional acrylics. Wildfire paints can be brush, roll, or spray applied. To achieve the optimum appearance, spray apply Wildfire paints. Rolling: Use a high-quality medium nap roller. Spraying: Use an HVLP spray gun with an air compressor. When spraying, be sure to use a properly fitting NIOSH approved breathing mask. Wildfire paints can be thinned up to 40% with water for proper spray viscosity for airbrush use. IMPORTANT NOTE: Thin gradually over thinning will cause loss of hide. Coverage: One gallon/3.78 liters will cover approximately 200 to 250 square feet/19 to 23 square meters. Film Properties: Drying time at 70°F and 50%RH: Dry-to-touch is in approximately ½ hour. Re-coat time is in approximately one hour. Full cure is in approximately 24 hours. Lower temperature and higher humidity will lengthen the dry and cure times. WOOSTER Z1121 YACHTSMAN ANGULAR SASH PAINT BRUSH SIZE:1.5" PACK:12 PCS. ENCORE 05175 PAIL LINER SIZE:5 GALLONS PACK:50 PCS. GEMINI SOL-0500-1 #500 LACQUER THINNER SIZE:1 GALLON. HYDE 28040 RIGID ALUMINUM SPRAY SHIELD W/PIVOT NECK & 18" HANDLE SIZE:48" X 9"
SONNEBORN 68961 ULTRA WHITE SEALANT ONE PART URETHANE SIZE:10.6 OZ. PACK:30 PCS. MODERN MASTERS TP10453-GAL HI HIDE WHITE THEME PAINT SIZE:1 GALLON. MODERN MASTERS PSMP726 RUST PLATINUM SERIES METALLIC PLASTER SIZE:1 GALLON. MINWAX 41450 450 ROYAL WALNUT GLOSS POLYSHADES SIZE:PINT.